Our story began on 22nd October 2002, the opening date of the first Vapiano restaurant in Hamburg, Germany, on Hohen Bleichen Street. Inspired by the famous Italian saying “Chi va piano va sano e va lontano”, the founders of Vapiano decided more than 15 years ago to create an Italian-Mediterranean food brand, one of quality, authenticity and warmth. Vapiano makes it a point of honor to make each of its restaurants an ideal place for relaxing and gathering, where you can enjoy delicious Italian specialties in a homelike atmosphere. From the pasta prepared daily in the “Manifattura” to the desserts, homemade dishes cooked right in front of guests and the freshness of products are at the heart of Vapiano’s values. Each dish is a flavourful taste experience that transports our guests under the sun of Italy. Today there are already 200 Vapianos in more than 33 countries in the world. The brand continues its development in France, where it has established a network of 20 restaurants with several openings planned for 2018. * “He who goes slowly goes safely and far.”, it means that we will go far if we go serenely and eat well. When we push the door of a Vapiano restaurant, we are reminded of Italy. Lighting similar to natural sunlight, the noble materials of the furniture, the green walls and the multi-centenary olive trees, every detail immerses our guests into the heart of a true Mediterranean decor. The Milanese architect and interior designer Matteo Thun wanted to transcribe in the construction of the restaurants all the freshness and quality of the Vapiano cuisine, creating a cosy atmosphere, typical of Italy. It is possible to have a drink, to share some antipasti for aperitif or to enjoy a good meal around one of the beautiful blond oak tables in the center of the spacious dining rooms. These large tables are great for discussions and can accommodate up to 8 people. Our guests can sit with friends and family but also with other people, thus promoting the spirit of sharing dear to Vapiano. From the homelike atmosphere to the art of hospitality and design, at Vapiano everything is conceived to give you an Italian getaway within the space of a meal. Vapiano offers different spaces with different atmospheres and functionalities to satisfy both children and adults. Want to enjoy a moment in the sun or imagine yourself on holiday in Italy? 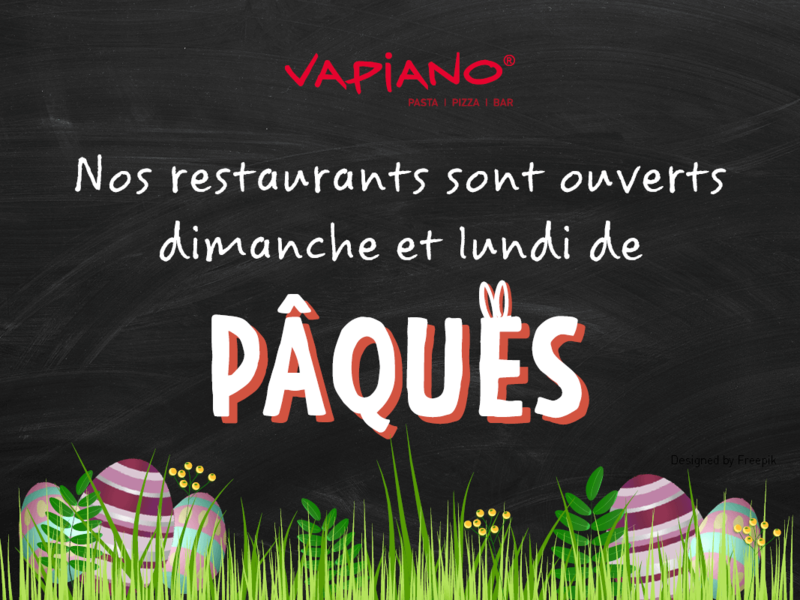 The large terraces of Vapiano Marseille, Metz, Nantes, Strasbourg and Paris (in the restaurants of Bercy Village and La Defense), are ideal for a moment of relaxation and conviviality on sunny days. Some also offer a breathtaking view, such as the splendid rooftop of ​​Vapiano Marseille Terrasses du Port with amazing sea view or the beautiful deck of Vapiano Villages Nature overlooking the lake. While parents are chatting at the table, children can play in the Kids Zones at Vapiano Villages Nature, Disney Village® and Bercy Village. The bar & lounge spaces present in every Vapiano offer more intimacy, perfect for enjoying a cocktail or sharing a bottle of wine with your friends and loved ones. Seduced by the cuisine, guests can visit La Bottega, a delicatessen of Mediterranean specialties found in two Parisian restaurants: Vapiano 4 Temps and Bercy Village. Wine, cheese, sausage or pasta freshly made in the Manifattura, many Italian specialties are on sale so guests can take a piece of Italy home with them. The number of Vapiano restaurants in the world. The number of Vapiano in France. Many openings are planned by the end of 2019.